Chief Complaint: 67-year-old female with a history of hypertension (HTN) and diabetes (DM) who complains of gradual, painless vision loss OD and presents to the retina clinic for a second opinion in regards to her diabetic retinopathy. History of Present Illness: She was told by another eye clinic that nothing else could be done for her diabetic retinopathy OD. The patient reports a gradual decline in vision OD. No complaints of pain, headache, or other problems. Her blood sugars range from the 80s to 130s which she "checks weekly". PMH/FH/POH: DM treated with oral hypoglycemics and HTN treated with atenolol. History of focal laser treatments for diabetic macular edema OD and OS. Best corrected visual acuities: 20/250 OD and 20/25 OS. Confrontational VF: constricted OD and OS. Anterior segment: no iris neovascularization, 1-2+ NS cataracts OD and OS. Photograph of the right fundus denoting: flame hemorrhages, dot-blot hemorrhages, macular exudates, marked macular edema, microaneurysms, and cotton wool spots. No neovascularization observed on exam. 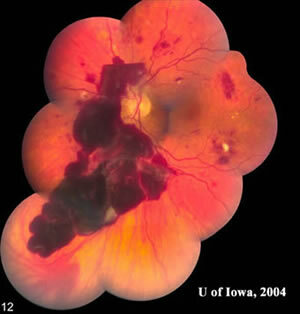 Photograph of the left fundus denoting: flame hemorrhages, dot-blot hemorrhages, macular exudates, microaneurysms, cotton wool spots, and massive subhyaloid hemorrhage with blood layering out superiorly. No neovascularization observed on exam. This female presents with HTN and DM. There was marked macular edema in the right eye with cotton wool spots, flame hemorrhages, and intraretinal hemorrhages, which are seen in both HTN and DM. 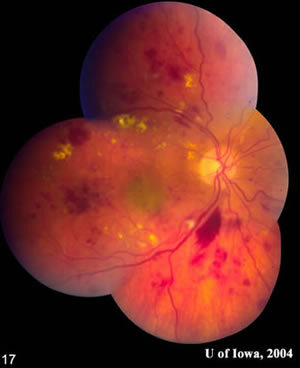 However, we do not expect to see numerous large flame hemorrhages in diabetic retinopathy. She also presented with a subhyaloid hemorrhage in the left eye without evidence of neovascularization initially; however, we suspected that neovascularization may have been the source of bleeding. This made us suspicious for a cause other than her diabetes. Her blood pressure was checked which was 270/110 with a pulse of 66. She was asymptomatic. Her hemoglobin A1C was 6.5%. She was admitted by internal medicine to lower her blood pressure slowly to avoid end organ ischemia. Hypertension (HTN) can cause end organ damage, for instance to the central nervous system, cardiovascular system, kidneys, and eyes. Any blood pressure greater than 220 systolic or 120 diastolic is a hypertensive urgency if no evidence of end organ damage is seen. Malignant and accelerated HTN are medical emergencies. Malignant HTN is diagnosed when papilledema is present. Accelerated HTN is diagnosed when there is evidence of end organ damage without papilledema, in this case the eyes. After this patient's hypertensive retinopathy resolved, we found some neovascularization of the retina in the left eye. She received a course of PRP laser to the left eye. 1% of patients with essential HTN will develop malignant/accelerated HTN. Risk factors: smoking, African American, and secondary HTN. Prior to therapy, life expectancy was less than 2 years. The survival rate at 1 year was 25% and 5 years was less than 1%. With current therapy including dialysis, the survival rate at 1 year is greater than 90% and at 5 years is 80%. Eyes: cotton wool spots, exudates, macular edema, flame hemorrhages, vitreous hemorrhage, AV nicking, arteriolar narrowing, copper wiring of arterioles, and papilledema. Cardiovascular: check blood pressure in both arms for evidence of aortic dissection/coarctation, carotid/renal bruits, palpation of precordium shows sustained left ventricular lift, 3rd or 4th heart sound with/without murmurs. Death caused by stroke, heart failure, and kidney failure. Reuler JB, Magarian GJ. Hypertensive emergencies and urgencies: definition, recognition, and management. J Gen Intern Med. 1988 Jan-Feb;3(1):64-74. Suggested citation format: Doan A, Russell S: Accelerated Hypertension: 67-year-old female with HTN and DM with painless vision loss. February 21, 2005; Available from: http://www.EyeRounds.org/cases/case17.htm.